She had an alchemist’s touch for transforming any material which fell in her hands, glass, porcelain, fabric, painting, into a work of art as demonstrated at the Exposition universelle des Arts décoratifs et industriels of 1925 where she participated both at the Lalique and the Sèvres factory pavilions, not to mention the décors designed for Théodore Haviland, all of which drew widespread praise from critics. The granddaughter of ornemantalist sculptor Auguste Ledru (1837-1918), daughter of René Lalique (1860-1945) and wife of Paul Burty-Haviland, a photographer from the famous porcelain family, Suzanne Lalique-Haviland rose to the heights of her names and the artistic legacy she received. The exhibition staged at the recently created musée Lalique, see article in French, in collaboration with the one in Limoges, is highly successful. This is the first retrospective organized in France of a multifaceted artist who remained in the shadows for too long due to excessive modesty. The chronological and thematic visit does an excellent job of presenting the versatile and polyphonic scope of her work establishing an eloquent dialogue among the different materials she decorated (ill. 1). 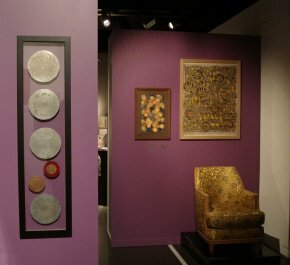 These juxtapositions reveal a personal, feminine and daring style while the presentation of her many drawings and watercolors gives an idea of her role in various factory productions : although her name was not always directly linked to the final objects Suzanne provided numerous designs. The book published for the occasion offers a fine overview of current knowledge on the artist and closes with a catalogue raisonné of her works, reproduced in vignettes. The very thorough essays each look at the many aspects of her creativity ; we can see how hard it would be to write a detailed entry for each plate or vase but we would have enjoyed reading at least a few. The exhibition opens with projects for lids to face powder boxes ; the box Houppes, made of cardboard and glass, was one of Suzanne Lalique’s first productions, created in 1910 for the perfumer, Coty. 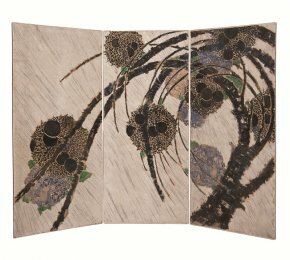 In the following room, visitors can admire the only folding screen remaining today (ill. 2) although she produced many of them between 1914 and 1927, in gouache on paper or painted on canvas, acquired notably by Jacques Doucet as of 1913. The one exhibited here is a fine illustration of how the artist liked to play with unbalanced compositions and twisted lines, evoking her favorite themes all drawn from nature - flowers, foliage, animals. Later on with the passing of time, her style would evolve towards a more understated manner. 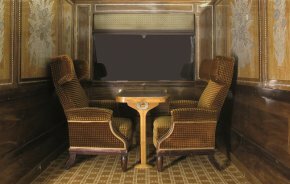 Suzanne, who was skilled in designing interior decorations and creating overall effects collaborated with her father in 1920 on the project for the Salon de conversation on the Paris transatlantic liner, commissioned by the Compagnie Générale Transatlantique - she designed notably the fabric for the curtains and certain seats. 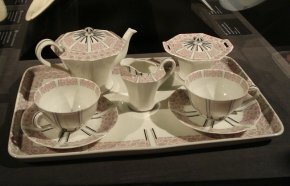 In 1928, the Compagnie internationale des Wagons-lit turned to the Maison Lalique to order the décors for the coaches on the Côte d’Azur Pullman Express, one of which had platan paneling inlaid with a flower bouquet in silver dust and glass paste ; the bouquet corresponds to a drawing by Suzanne who also designed the motif on the velvet for the seats and carpet. The Musée Lalique holds a maquette on a 1/1 scale of a salon coach as well as for a pair of armchairs, pre-empted by the State at the Christie’s auction in Paris on 27 September 2011 (ill. 3). Suzanne confirmed her talents with textiles by developing models for Tassinari et Chatel, Prelle and perhaps the Lauer house. The Tassinari et Chatel factory holds a daisy brocade (still produced today) based on a 1913 project (ill. 4) and Prelle still manufactures the fabric Branche de prunus designed for the liner Paris. The Musée des Arts décoratifs lent a series of gouaches and watercolors which are no doubt projects for printed fabrics. 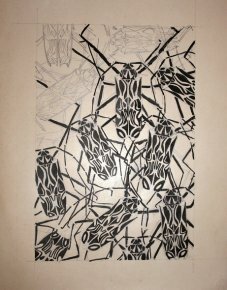 Here again, the artist chose flowers and insects which she simplified to obtain geometric and stylized forms such as these swarming beetles (ill. 5). 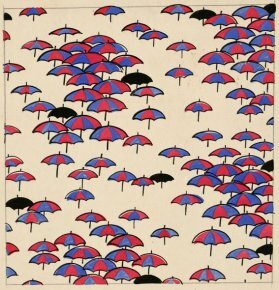 But she also find inspiration in everyday life and created more popular subjects, from the balloon seller to clowns, as well as bows and parasols (ill. 6). All of these projects were acclaimed by critics and yet, we know of few fabrics produced from these patterns. 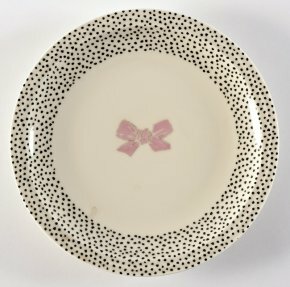 Between 1910 and 1930 more or less, Suzanne Lalique contributed to renewing Sèvres porcelain working first alongside her father, who collaborated closely with the factory. Then as of 1911, she developed architectural décors as well as compositions for formal and everyday pieces. She was noticed at the 1925 Exposition where she blended flowers and fruits for the mural decoration of the vestibule in the Sèvres factory pavilion. 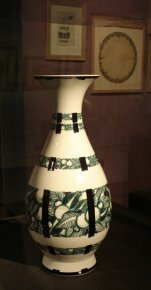 Porcelain pieces also attest to her ability for renewing ornamentation, such as the Bertin vase (ill. 7), with its black and green colors and its frieze motifs. 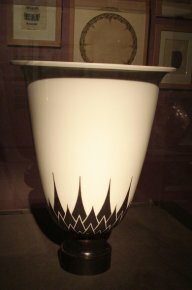 In 1927, the Rhulmann n° 2 vase bore a very sober décor of stylized leaves, permitting the white porcelain to stand out (ill. 8). The artist thus adapted to Art Déco, both in porcelain and in glass, favoring simplified lines and geometric motifs without compromising her artistic personality. The wife of Paul Burty Haviland, she naturally devoted herself to Limoges porcelain. William, Paul’s cousin, asked her to work for the Théodore Haviland factory , enthusiastically received at the 1925 Exposition for which Suzanne designed the décors Green Tree and Black Grapes and Arcades. The torsions of Green Tree and Black Grapes (ill. 9) recall those of the folding screen and can be found on other supports, in either decorative panels or even the table lamp by René Lalique Grapes (1927) which might well have been produced from his daughter’s drawings. 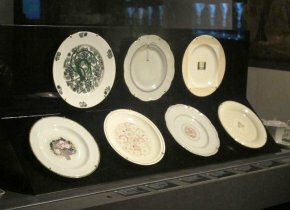 She did not balk at entirely covering the surface of a plate, thus creating a fine line between a functional and a decorative object. As for Arcades, gray scales outlined in pink, the design seems to be inspired by formal plates in Deruta’s Italian studios in the late 15th and early 16th centuries (ill. 10). The artist used unusual color shades, black and platinum (replaced by gray for economic reasons) ; pink also appeared frequently. "In 1925, Suzanne Lalique-Haviland thus embodies the union between the tradition of a French decorative spirit drawn from past references and the new spirit of the Exposition internationale", writes Jean-Marc Ferrer in the catalogue . She juggled between an Art Déco spirit and her own sensitivity, glimpsed in Sailboat, Duck and Crossing (ill. 9) ; here again, the motifs play with the shape of the plate. In fact, as of 1928, other types of décors appear on Théodore Haviland dinnerware, including Central Bouquet of Daisies, one of the resounding successes of this collaboration (ill. 9). "The success of an object does not come only from the quality of the décor itself, but above all the way in which it adapts to the form it is intended for." , insisted Suzanne Lalique who also paid careful attention to the color of the paste which was to receive the motifs : white paste porcelain, celadon or ivory shades. 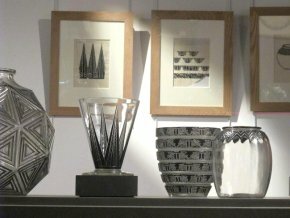 Besides the subjects taken from nature, she continued to play with geometric forms and introduced notably hatching effects. The Amphitron décor is strikingly modern (ill. 1) ; it is no doubt related to her friend, Jean Giraudoux, and his play Amphitryon 38, staged in 1929. Suzanne’s close circle form part of her creative designs : a service bears the name of her daughter Nicole (ill. 9), while the décors Marrakesh and Maroccan were inspired by her trip to Marocco in 1930 with her friends Paul Morand, Jean Giraudoux and Eirik Labonne. Her endless ingenuity never lost sight of simplicity, as eloquently shown in the Creole service, one of her favorites (ill. 11). Suzanne’s fame attracted patrons such as the prestigious Hotel George V, the Wagons-lits français in 1928, the Hotel Waldorf-Astoria in New York in 1930 and the Compagnie Générale Transtlantique for the salons in the Normandie liner in 1935. 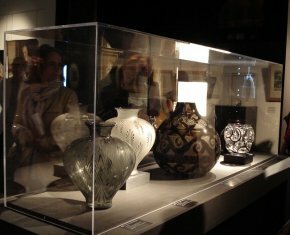 Concerning glass, her collaboration with her father at the Lalique factory is hard to determine as there are very few remaining designs of objects by her. René Lalique nevertheless must have looked at her watercolors for instance for the bottles of Capricorns and Ferns. 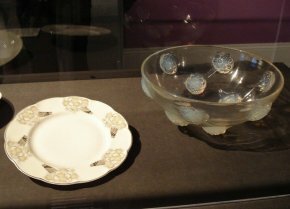 In fact, the borders between glass and porcelain seem to disappear, as seen in the bowl, Tournon from 1928, which repeats the motif of Bunch of Daisies from the Haviland service created by Suzanne for the George V (ill. 12), while the décor for the Amphytrion service recalls the Flora Bella bowl (ill. 1). Technically, Suzanne liked to use black enamelling to outline a décor like the one on the Oranges vase, while the Volutes vase reminds us that she experimented with etching (ill. 13). As did many others, Suzanne found inspiration in foreign cultures, encouraged by her husband’s interest in Pre-Columbian and Japanese art. The Nanking vase is an adapted copy of a small Japanese box from Paul Burty’s collection. The artist also studied Aztec works for the Lagamar vase and Frank Burty-Haviland’s African art collection for Nimroud and Pomegranate (ill. 14). Suzanne Lalique lived more than one life and was thus also a skilled painter, essentially still-lifes, with a Vuillard-like palette and a dynamic sense of centring her compositions probably reflecting the influence of photography. Her contacts with Eugène Morand, a painter and future director of the Ecole nationale des Arts décoratifs in Paris led her to try out this modern medium in which she led a veritable career, exhibiting at the Bernheim Jeune gallery in 1930. The Musée in Wingen-sur-Moder presents a series of canvases revealing both the artist’s intimate universe and an undeniable taste for stage setting. 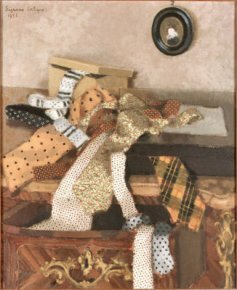 She generally focused on one element, a tie (ill. 15), a Fan or White Gloves, around which everything else is carefully disorganized, with sensual effects of materials. She exploited this knowledge of materials quite brilliantly in the theater. The year 1937 marked a turning point in Suzanne Lalique’s career : called for by Edouard Bourdet, she joined the Comédie Française where she quickly became director of decorations and costumes, until 1971. Charles Dullin commissioned the décor for Luigi Pirandello’s Each in his own Way, then in 1951, she created the décor and costumes for Molière’s Le Bourgeois Gentilhomme. 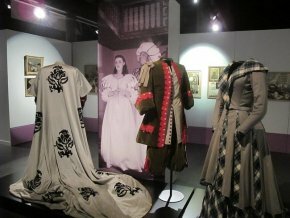 In a way, the artist reintroduced the unities of time and place in France, at least for the décors and the costumes ; a unity and harmony which were, and continue to be, acclaimed by critics. Suzanne worked for other theaters, as well as the opera, notably in Dialogues of the Carmelites at Garnier and also participated in the lyric art festival of Aix-en-Provence from 1960-1964. This part of her career is remarkably evoked with costumes, maquettes and watercolors in the last room of the exhibition before the curtain comes down on the visit (ill. 16). 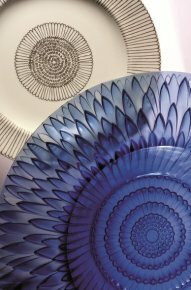 Whether dealing with textiles, glass or porcelain, Suzanne’s spirit overcame matter. Under the supervision of Jean-Marc Ferrer, Suzanne Lalique-Haviland. Le décor réinventé, 2012, Les Ardents Editeurs, 223 p., 36€. ISBN : 9782917032374. Visitor information : Musée Lalique, rue du Hochberg, 67290 Wingen-sur-Moder. Tel : 0033 (0)3 88 89 08 14. Open every day until 30 September, from 10 am to 10 pm and from 1st October to 31st March, Tuesday to Sunday, from 10 am to 6 pm. David Haviland had two sons, Charles Edward (Paul Burty’s father) and Théodore ; they stopped working together in 1892 and each created separate factories. Paul was close to his cousin William who worked for Théodore Haviland. "Suzanne Lalique-Haviland et la porcelaine de Limoges : une décoratrice du sensible", exhibition catalogue p. 84. A Suzanne Lalique-Haviland letter, 8 February 1934. Catalogue p. 81.